All month we have discussed the importance of developing a marketing strategy, including setting goals as a marketer, conducting market research to improve how you promote your business, and how looking at your competitors can make you a better marketer. We cannot understate the value and importance of a marketing strategy. It serves as a roadmap for all of your marketing activities. However creating your roadmap is only one piece of the puzzle. Once you have your roadmap set, the next step is to follow it. Creating a plan for implementing your marketing strategy will make the most of your time, effort, and money. Detail a plan for documentation and communication – Miscommunication amongst your team can cause many problems such as delays, incorrect information being sent to your audience, subpar work, and a host of other issues you would like to avoid. To prevent this, create a plan which details the marketing goal(s) you are working towards completing, who is responsible for what, where marketing assets are saved, and how to document any notes or questions. This will help your team stay on the same page and lower the chance a mistake is made due to miscommunication or lack of documentation. Assemble and organize your resources – This one goes hand in hand with the previous step. As a small business you have a finite amount of resources which means you must make the most of them. To do this write down everything you would like to designate for your marketing purposes. This includes staff, time, money, images, videos, copy, and anything else you believe will help you reach your marketing goals. Once you have a list of all your resources write down how much of each resource you wish to designate for marketing purposes and what each resource should be contributing. For example for each employee you plan on using to promote your business document how many hours per day or week they should spend as well as what they should be doing in that time. Doing this for all your resources will go a long way to making the most of what you have to work with. Get your marketing tools in order – By marketing tools we mean anything that helps you get your message out. Do you use a a service like Hootsuite or Buffer to schedule your social media messaging? How about MailChimp or Constant Contact for emailing? Whatever you use, make sure the right people have access and understand how and when each tool is to be used. Outline your marketing calendar – We have spoken before on what a marketing calendar is and how useful one can be. A marketing calendar essentially outlines the implementation of your marketing strategy. It details what marketing channels you are using, what types of content you are publishing, and by when. This further helps you assign your resources and track what and when certain tasks need to be done. Create a plan for review – Once you begin implementing your marketing strategy create a plan to review how it is performing. You, of course, want more leads but go deeper by looking at how many new followers you are getting, how many likes, shares, and comments Essentially you want to understand what your audience is responding to and what is missing the mark. Evaluating your marketing performance will give you a chance to make improvements to what is not working and reinforce what it working. You have spent time, energy, and money on developing a marketing strategy, therefore you want to make sure you get the most out of it. These five steps will help you devise a plan to promote your business in the most effective and efficient way. Need help developing a marketing strategy? Great news! 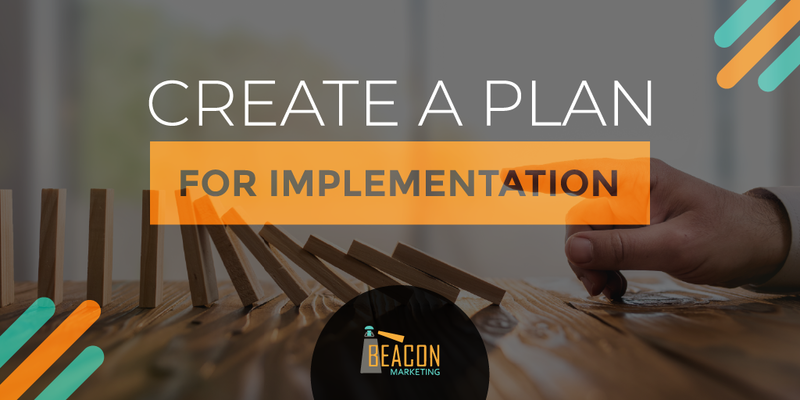 Beacon Marketing has developed a DIY guide for small and medium sized business owners which walks them through the process of creating a customized marketing strategy. The Definitive Marketing Strategy Guide takes the guesswork out of marketing and allows you to promote your business like a pro. Click here for more information!